Compositional Grading in Oil and Gas Reservoirs offers instruction, examples, and case studies on how to answer the challenges of modeling a compositional gradient subject. Starting with the basics on PVT analysis, applied thermodynamics, and full derivations of irreversible thermodynamic-based equations, this critical reference explains gravity-modified equations to be applied to reservoirs, enabling engineers to obtain fluid composition at any point of the reservoir from measured data to create a stronger model calibration. Once model-parameters are re-estimated, new sensibility can be acquired for more accurate modeling of composition, aiding engineers with stronger production curves, reserve estimations, and design of future development strategies. 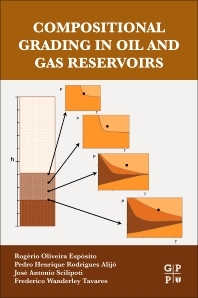 Multiple examples and case studies are included to show the application of the theory from very simple to more complex systems, such as actual reservoirs influenced by thermal diffusion and gravity simultaneously. Other example include a layer for which asphaltene precipitation takes place in the reservoir and three –phase flash algorithms for liquid-liquid-vapor equilibrium calculations, detailing the techniques necessary to ensure convergence. The book combines practical studies with the importance in modeling more complex phenomena, filling a gap for current and upcoming reservoir engineers to expand on solutions and make sense of their reservoir’s output results. Rogerio Oliveira Esposito is currently a Senior Process Engineer at Petrobras, assigned to the Reservoir Engineering department specializing in production development design, fluid modeling of reservoir fluids, and compositional grading determination for initializing reservoir simulations. Previously, he was a PVT analysis engineer for Petrobras and a process engineer for Petrobas' REDUC refinery. He has taught classes at the Federal University of Rio de Janeiro (UFRJ), and Gama Filho University in Brazil, all in the department of chemical engineering. He earned a Bachelor of Science in chemical engineering from UFRJ, a Masters of Science in chemical engineering from UFRJ, a doctorate in chemical engineering from UFRJ, and a post-doc from the Reservoir Engineering Research Institute in California. Pedro Henrique Rodrigues Alijó is currently Adjunct Professor at the Rio de Janeiro State University (UERJ). Previously, he was a Research Assistant at the Foundation of Coordination of Projects, Research, and Technological Studies (COPPETEC Foundation) as well as D.Sc. Fellow and M.Sc. Fellow at the Federal University of Rio de Janeiro (UFRJ). He earned a Bachelor of Science in chemical engineering from the Federal University of Bahia in Brazil, a M.Sc. degree in chemical engineering from UFRJ, and a D.Sc. in chemical engineering from UFRJ. José Antonio Scilipoti is currently a postdoc student in the Department of Chemical Engineering at the Federal University of Rio de Janeiro. Previously, he was Manager on coatings at Matarfer in Argentina and a proces engineer at Tedsid. He earned a BA in chemical engineering from the National University of Cordoba in Argentina, and a PhD in chemical engineering from the National University of South, also in Argentina. Frederico Wanderley Tavares is a full Professor at the Federal University of Rio de Janeiro (UFRJ). Previously, he was Associate and Assistant Professor at the same university. He is an active member of multiple committees and has published over 115 papers. He earned an undergraduate degree in chemical engineering from UFRJ, a M.Sc. in physical-chemistry from UFRJ, a D.Sc. in chemical engineering from UFRJ, post-doctoral in chemical engineering from the University of Delaware, and a post-doctoral in chemical engineering from the University of California at Berkeley.